When user A purchases WooCommerce (downloadable) product P1, he’s able to download P1 file for 3 times (within 14 days – optional). After the period or download limit, the download link expires. P1 file for 3 times (within 14 days – optional). The P1 download limit is reset and its download link becomes valid again. Step 2: Go to “Prevent Direct Access Gold”, “WooCommerce” tab, put the 2 IDs in order of your preferences, i.e. the first ID will be product P1; the second one, product P2 in the example above. 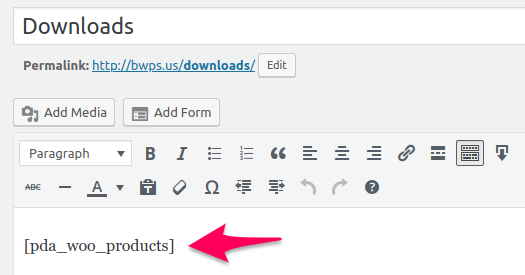 Step 3: Create and go to “Downloads” page, put this shortcode [pda_woo_products] on its content. Basically, what the shortcode does is it lists all your WooCommerce products that a user has purchased. If they haven’t purchased anything, the page will be empty. In case you’ve protected your digital product with our Prevent Direct Access Gold, please remember to create and use its private link on File URL field instead. Otherwise, the WooCommerce’s download link after purchase will not work. Once purchased, the Downloads page display the “Top 7 Business Advice” ebook. We download it once. So the download remaining becomes 1.